Actually it has been for sale for some time, but it has just occurred to me that I have not actually put it on the blog, sorry! I have also discounted postage (see below) so that shipping is free on a single calendar within the UK. Postage is charged in all other cases, but the booklet format of this calendar means it is exactly the same size as last year’s when hung on the wall, but costs half of what last year’s cost to post! If you have any questions do please email me. 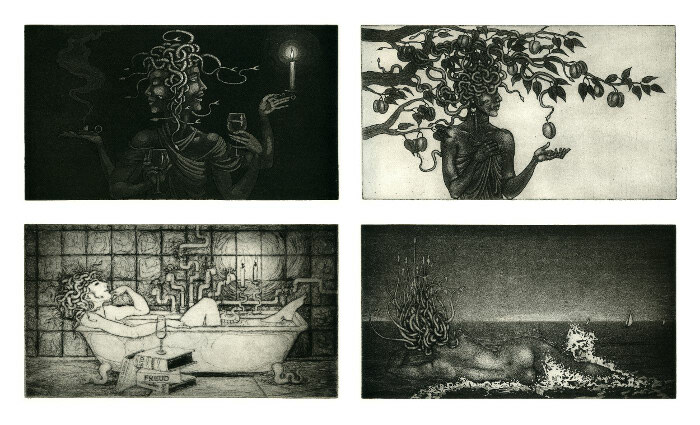 The images in 2014’s calendar are reproductions of a series of 12 intaglio prints inspired by the passing of the months, and all featuring Medusa, the snake-haired lady – some say goddess – of Greek myth and legend. 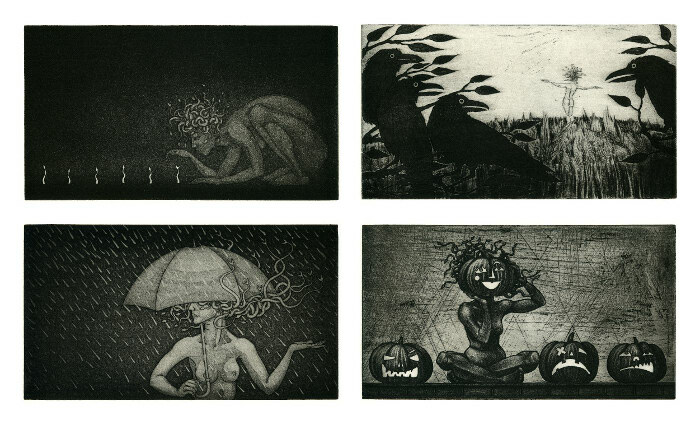 They were made especially for this calendar are mostly etchings, though I have also used some drypoint and mezzotint techniques. 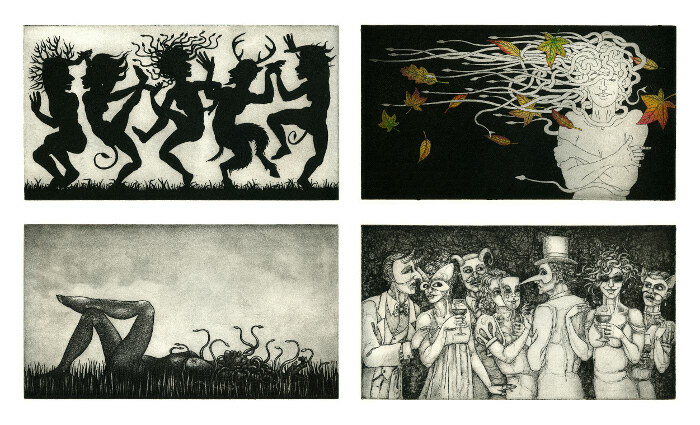 All are monochrome, printed in black on a slightly parchment-coloured watercolour paper, except for November, which also has coloured details. Limited numbers of the original prints are also available for sale, please email me for more information if you’re interested in the original prints. Here is my little video clip of the calendar, unfortunately the image quality is nothing like the still photos, but it might give you an impression of the look and feel of the calendar. This booklet idea is a new one for me, and I’m really pleased with it – I think it might be my new way of doing calendars! A lovely, large, satin-finish calendar which hangs on the wall, but also folds as a booklet. 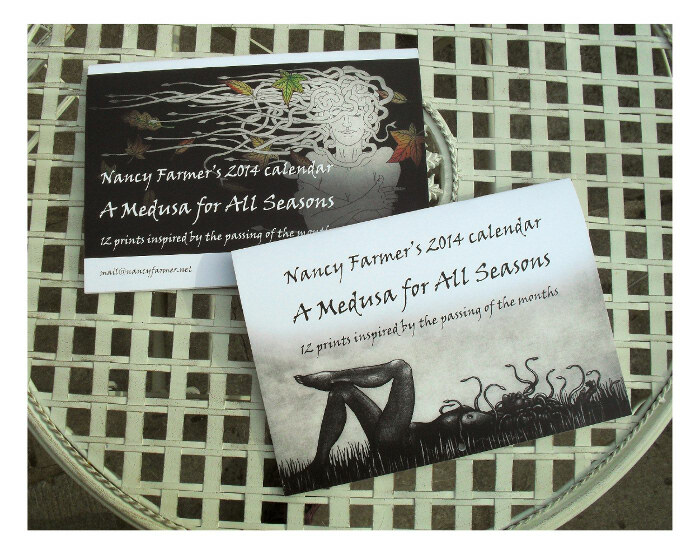 Price: £12 each or £9.50 each if you buy more than one calendar at once (plus shipping and packing). How many calendars you would like. Which shipping destination you require: UK / Europe / Everywhere Else. How you would like to pay: credit card via paypal, cheque, etc. (please don’t email me your card details). I can then respond with your total including shipping. 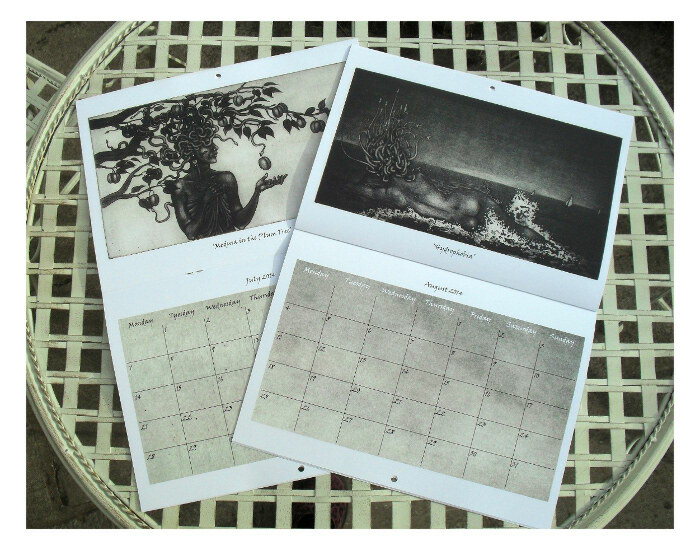 I have discounted shipping within the UK so that the first calendar is free. Here are the costs for shipping one to three calendars, If you’d like more, I can happily work out your costs! I bought last year’s calendar for myself and for Christmas presents. A beautiful, subversive, and unique calendar by a proper artist.